A mom received the shock of her life as her husband surprised her at the hospital after she welcomed their twin girls. Cydney Cooper of Topeka, Kansas, had given birth two weeks earlier to Emma and Kyla Cooper. 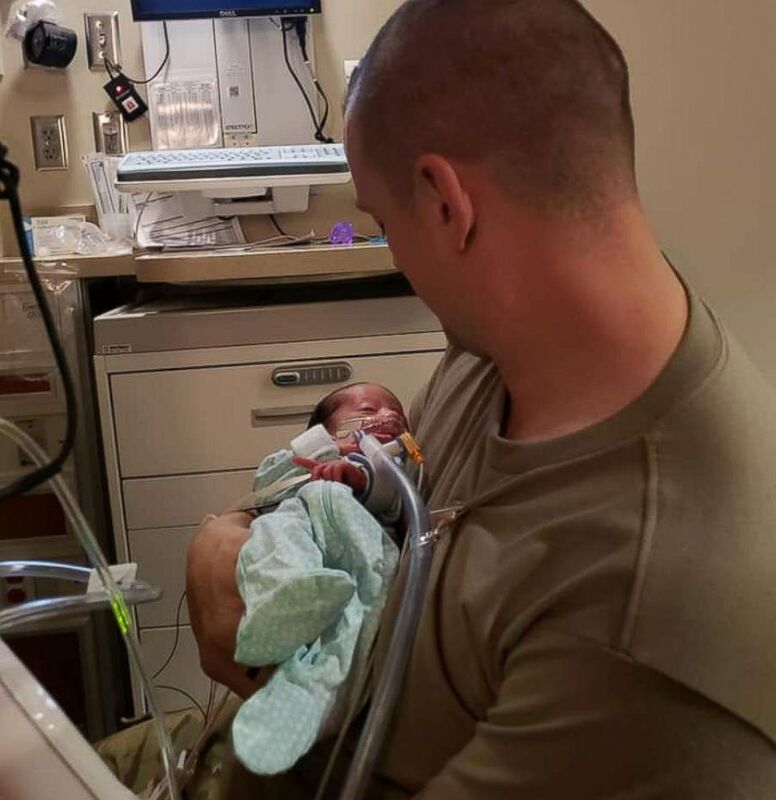 Her husband Skyler Cooper is a member of the Kansas Army National Guard and had been stationed in Kuwait. It had been 7 months since the couple had seen one another. Skyler Cooper, a member of the Kansas Army National Guard, holds his newborn daughter, Emma Cooper, on Feb. 4. On Feb. 4, Cooper, who had given birth early at 33 weeks pregnant, was visiting her children in the neonatal intensive care unit. She had been texting Skyler to update him on how the girls were doing when suddenly, he entered the room. "I was in shock," Cooper told "Good Morning America." "I felt like I had to almost take a breath again. I had been bouncing around so much between our boys and the girls, I was also relieved." The Coopers are also parents to two boys, Leighton, 3 and Corbett, 1.
Cooper's tearful reaction was captured on video. She shared it on Facebook where it garnered 6.4 million views. "It was an incredible moment to see him meet his daughters for the first time," Cooper said. "We just want to get them home now." 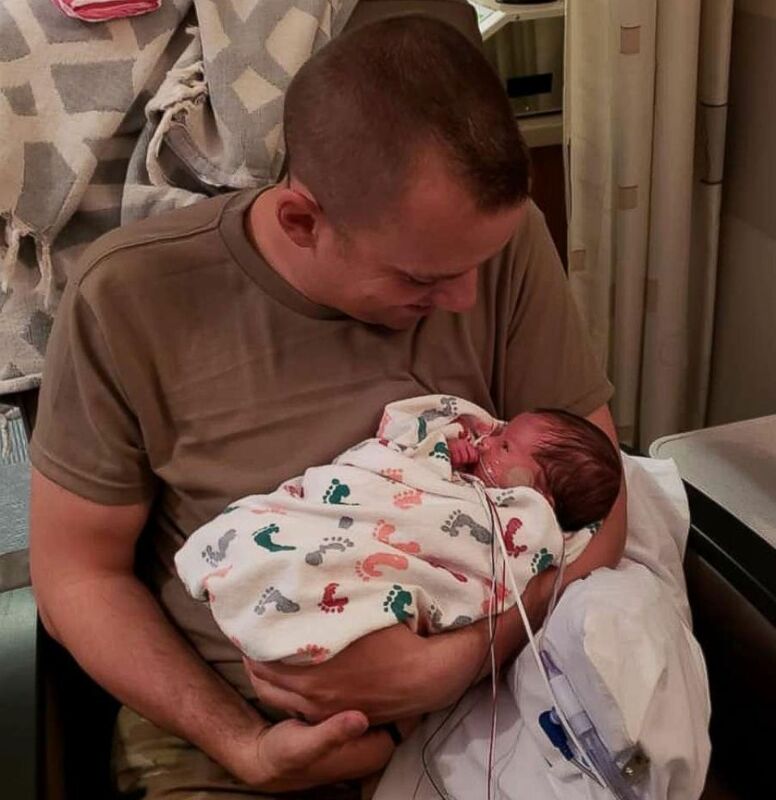 Skyler Cooper, a member of the Kansas Army National Guard, holds his newborn daughter, Kyla Cooper, on Feb. 4.
Cooper said the girls are doing extremely well, but need to grow a little more in the NICU before the entire family is under the same roof again. 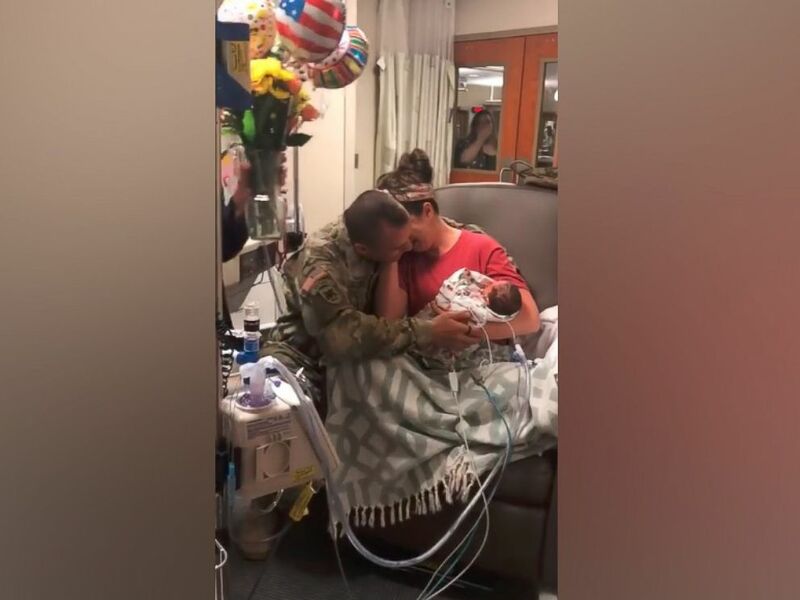 Skyler Cooper, a member of the Kansas Army National Guard, surprises his wife, Cydney Cooper of Topeka, Kansas and their newborn twins, Emma and Kyla Cooper.